As more and more Americans become enlightened about the real history behind Christopher Columbus and his brutal exploitation of indigenous peoples, many are struggling to reckon with the explorer’s problematic legacy. One state, however, just drew a stark line in the sand: Iowa has officially replaced Columbus Day with Columbus Hour. Wow. Now this is a step in the right direction! The Iowa General Assembly passed the historic measure earlier this week in a blunt rebuke of Columbus’s complicated past. “We can no longer ignore the many atrocities Christopher Columbus committed against the native inhabitants of this country, and, moving forward, we will no longer dedicate more than one hour each year to celebrating his memory,” said Iowa governor Kim Reynolds in a statement. 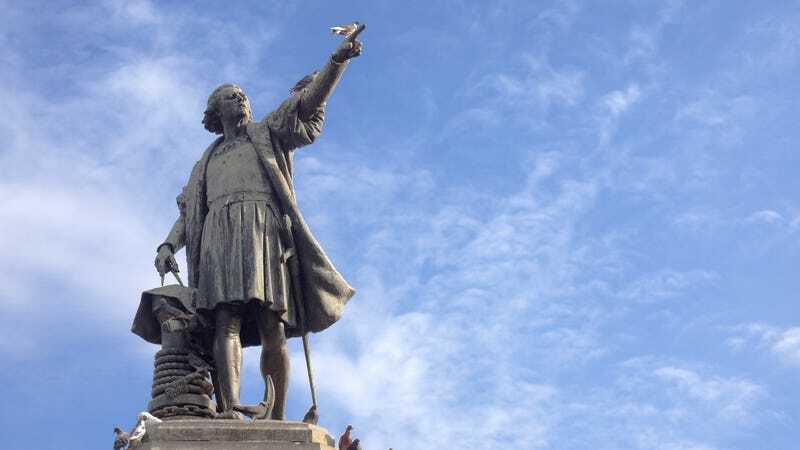 With this forward-thinking change, the state has struck a more sensible balance between honoring tradition and acknowledging historical wrongs, as Iowans can still enjoy the annual Columbus-related events they’re accustomed to but in an abbreviated form. For example, Sioux City’s Columbus Day Parade, which has drawn criticism in the past for turning a blind eye to Columbus’s barbaric violence against Native Americans, will now be a much quicker affair, with the marchers doing a brisk jog to fit in all the jubilant floats and performances in under an hour. Schools and workplaces will also be let out as they always have, but only for an hour, requiring students and employees to hurry back once the 60 minutes of Columbus fanfare are up. While stores will still be holding their annual Columbus Day sales events, they too will be limited to an hour, and many businesses will not be offering as good of bargains as in previous years so as not to appear overly celebratory. By demoting Columbus Day to Columbus Hour, Iowa is making major progress toward confronting the dark reality of our nation’s past, setting a bold precedent for the rest of the country. Here’s hoping more states follow Iowa’s lead in toning down their sanctioned glorification of historic racial violence. Way to go, Iowa!